The Capacity Development unit has produced new training guidelines for graduate fellow researchers at ILRI (photo credit: ILRI/Paul Karaimu). New training guidelines for graduate fellow researchers at the International Livestock Research Institute (ILRI) are now in place. The new guidelines were revised in November 2013 by ILRI’s Capacity Development (CapDev) unit after an assessment of the training needs of ILRI graduate fellows and the need for trainings that continuously enhance the research capacity of fellows. Through the graduate fellowship program, ILRI has over the years provided opportunities to thousands of young scientists and graduate fellows from National Agricultural Research Organizations (NARS), universities and other institutions in Africa and other parts of the world. These researchers carry out research-for-development (R4D) activities within ILRI projects, have access to ILRI’s cutting-edge research facilities and are mentored by ILRI scientists, while at the same time, the fellows contribute to ILRI’s research for better and more sustainable use of livestock. The CapDev unit plays a leading role in the training and development of graduate fellows by carrying out training needs assessments, and designing and facilitating crosscutting training programs to continuously enhance the research skills of these fellows. CapDev has developed a series of modular courses for graduate fellows in collaboration with ILRI’s research methods group, and communication team. These modules include trainings in conducting literature reviews, designing research studies, managing and analysing data, and a module on presentation skills that helps students in effectively sharing their research findings. The ‘bite-sized’ trainings are shorter, use less printed material and are more memorable. On average, each session is delivered within 3-4 hours and 2 sessions are carried out every month followed by additional one-to-one mentoring and assignments. A total of 8 such sessions were delivered between September and December 2013. Training opportunities at the ILRI campus, which minimise absences from work and give graduate fellows flexibility in choosing courses. Courses are performance-based and are tailored to the real needs of graduate fellows. Use of ILRI staff capacities and internal expertise helps to better integrate theory and practice resulting in better learning. Those trained share their experiences in future modules. The modules are designed creatively with highly interactive and participative sessions and are relatively easy to adapt to different training contexts. Graduate fellows have the opportunity to network with others fellows in different research programs as well as with ILRI colleagues delivering these trainings. ‘When I came to ILRI as a graduate fellow in August 2011, we did not have regular interaction and learning together. It was more like a walk through the jungle called “research”. The modular trainings have improved interaction among fellows and our scientific skills. Bravo CapDev!’– Jerome Wendoh, MSc fellow with Animal Biosciences. ‘In 2014, the CapDev unit together with the RMG group and other ILRI units, plans to build on the successes from the 2013 modular trainings. This will include identifying the gaps and training priorities for the year in consultation with fellows, research managers and ILRI mentors,’ said Joyce Maru, a capacity development officer at ILRI. Future modules may blend modular training, e-learning opportunities, effective mentorship support, and evidence and assessment to further enrich the fellows’ learning experience at ILRI. The blended learning approach will differentiate learning styles and allow flexibility and convenience for fellows to choose when and how they want to learn. The CapDev unit is also looking for ways of evaluating trainings that goes beyond knowing the numbers of those trained. Towards this end, CapDev will implement the ILRI graduate fellowship monitoring and evaluation policy, which clarifies the rationale for graduate training at ILRI and describes how training outcomes will be assessed across various training programs. For more information on ILRI graduate fellowships visit http://ilri.org/CapDev. 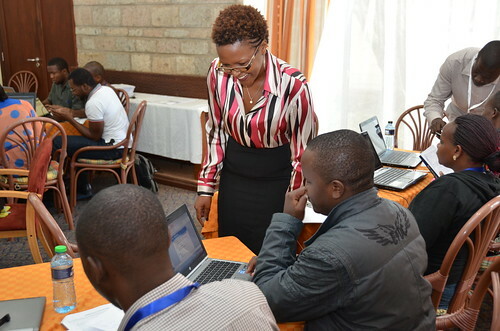 This article was written by Joyce Maru, a capacity development officer at ILRI. Tags: graduate fellowships, Joyce Maru, Modular trainings. Bookmark the permalink.